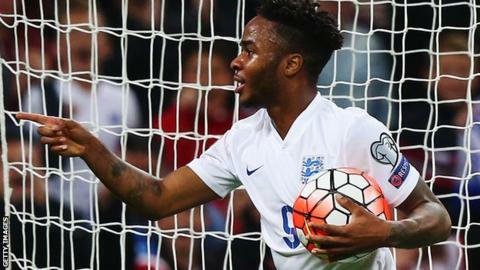 Sterling, 20, has made 18 appearances so far and has been backed by England boss Roy Hodgson to reach a century - a feat only nine men have achieved. "I want to do my best for my country and hopefully be up there with some of the players who have played, and try to achieve 100 caps," said Sterling. Sterling is in England's squad for a friendly in Spain on Friday and another against France at Wembley on Tuesday. With several injured players missing from Roy Hodgson's 22-man squad, only five of those included have more caps than Sterling, who won his first at the age of 17. During his time at Liverpool before his £49m move to City, Sterling was criticised for telling Hodgson he was "tired" before England's qualifying win in Estonia, but he believes the issue was blown out of proportion. "Roy asked me a genuine question, I answered, told him exactly how I felt and it was his choice to take me out of the squad, or the team. I didn't say at any point that I didn't want to play," added Sterling. Sterling - who began his career at Queens Park Rangers - feels he has now settled at City after "negativity" surrounding a "difficult" summer move from Anfield which made him the most expensive English player of all time. "I've realised that I'm doing well but can be doing better," Sterling told BBC Radio 5 live. "Since I've been at City I've been working hard and not focusing on the price tag. "I want to be scoring goals, goals, and more goals. My ultimate goal is to be a regular scorer, not just for Manchester City but for my country." Hodgson's side are training in Alicante, where they will seek to extend their 15-game unbeaten run - including 10 wins from 10 in qualifying for Euro 2016 - when they face Vicente del Bosque's European champions. "This is the real challenge," said Sterling. "We are going to be playing some of Europe's best teams and this is where we get to see where we are in terms of the tournament in the summer."